The Old Testament book of Daniel comes to life in this novel for readers of Lynn Austin's Chronicles of the Kings series or Francine Rivers' Mark of the Lion series. Survival. A Hebrew girl first tasted it when she escaped death nearly seventy years ago as the Babylonians ransacked Jerusalem and took their finest as captives. She thought she'd perfected in the many years amongst the Magoi and the idol worshippers, pretending with all the others in King Nebuchadnezzar's court. Now, as Daniel's wife and a septuagenarian matriarch, Belili thinks she's safe and she can live out her days in Babylon without fear--until the night Daniel is escorted to Belshazzar's palace to interpret mysterious handwriting on a wall. The Persian Army invades, and Bellili's tightly-wound secrets unfurl with the arrival of the conquering army. What will the reign of Darius mean for Daniel, a man who prays to Yahweh alone? Ultimately, Yahweh's sovereign hand guides Jerusalem's captives, and the frightened Hebrew girl is transformed into a confident woman, who realizes her need of the God who conquers both fire and lions. "Of Fire and Lions is a breathtaking and intricately told story of life and love in Babylonian captivity. Mesu Andrews's well-researched tale brings to life Daniel and his wife, showing in vivid detail the challenges their love experienced in a pagan and hostile environment. Andrews gives readers a fascinating inside look at familiar biblical accounts (like the three men in the fiery furnace), all the while developing a beautiful and timeless love story." --Jody Hedlund, author of Luther and Katharina, Christy Award winner "Mesu's stories are immersive in the best sense of the word. Tackling Daniel? Not easy. But she succeeds with a captivating story line and gives penetrating truths that will go deep into your mind and heart." --James L. Rubart, best-selling author of The Man He Never Was "Mesu Andrews is a master at writing biblical fiction! In Of Fire and Lions, she invites us on a seemingly familiar journey, and then--with a passion for truth and impeccable research--Mesu opens our eyes to an entirely new perspective that shatters familiarity and propels us right back to God's Word. 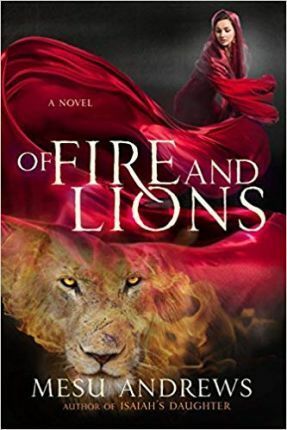 A compelling, brilliantly written novel, Of Fire and Lions is one of those rare stories that will stick with you for a lifetime." --Melanie Dobson, award-winning author of Catching the Wind and Hidden Among the Stars "A masterpiece of imagination that flows from both biblical and historical records, Of Fire and Lions will challenge you, convict you, and entertain you all at the same time!" --Anne Mateer, author of No Small Storm and Time Will Tell "Once again, skilled storyteller Mesu Andrews has accomplished what so many of us wish to do--peek into the lives of cherished and sometimes mysterious Bible characters, walk with them, hear the words behind their groans, and feel the change in temperature as the shadow of the Almighty falls over them. A beautiful and important novel." --Cynthia Ruchti, award-winning author of more than a dozen books, including Miles from Where We Started "Mesu's vivid prose transports you into the biblical world so vividly that the characters and setting become as real as any people or places you've experienced. Old Testament stories come alive with political intrigue, whirlwinds of thwarted romance, and life-changing risks and decisions. Immerse yourself in Of Fire and Lions, and it will change how you read the book of Daniel forever." MESU ANDREWS is the Christy Award-winning author of Isaiah's Daughter and numerous other novels, including The Pharaoh's Daughter, Miriam, and Love Amid the Ashes. Her deep understanding of and love for God's Word brings the biblical world alive for readers. Mesu lives in North Carolina with her husband, Roy, and enjoys spending time with her growing tribe of grandchildren.